Recently I was sewing a quilt. It had a face on it which turned out to be larger than I expected. 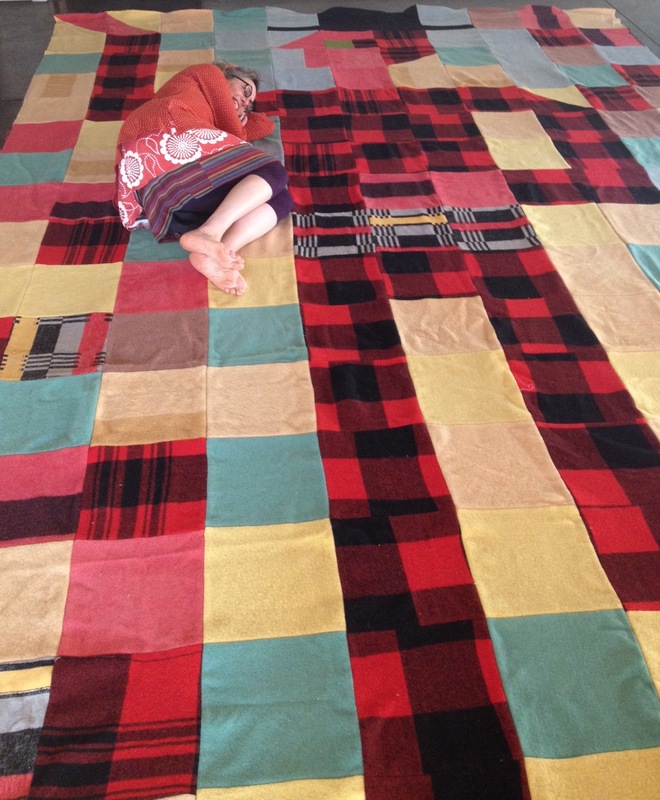 I wondered what a REALLY big quilt would look like. 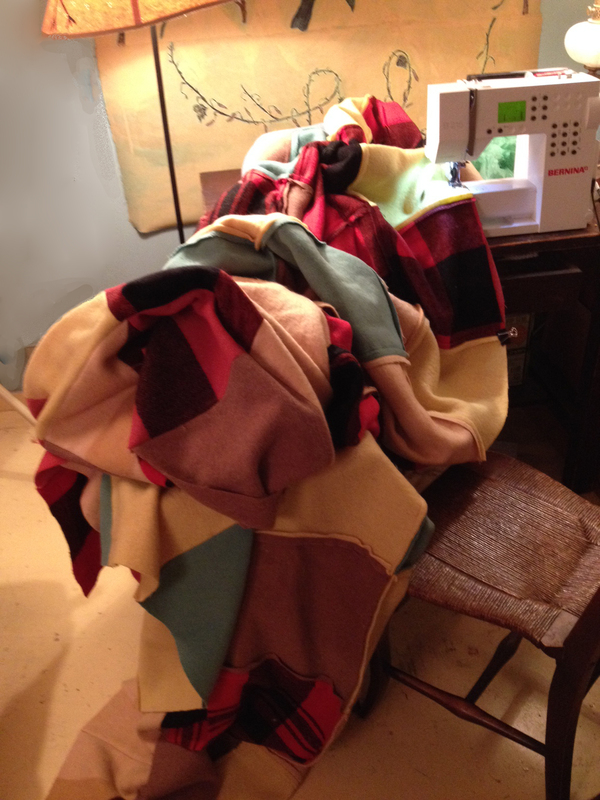 Hmmm – if I sewed together pieces of old wool blankets I could make a very large quilt without backing it. And thus the idea for Mr. Big was born. I put out the call for wool blankets and several kind people gave me some.Thank you Fay Jones, Kate Harkins, Reeta Tollefson, Diane Glenn and Marcia Paschkis! 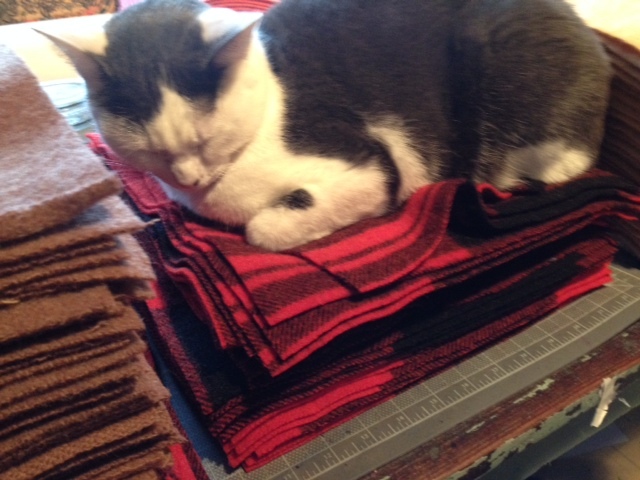 I cut all of the blankets into 12″ squares which my trusty cat Ruby guarded. 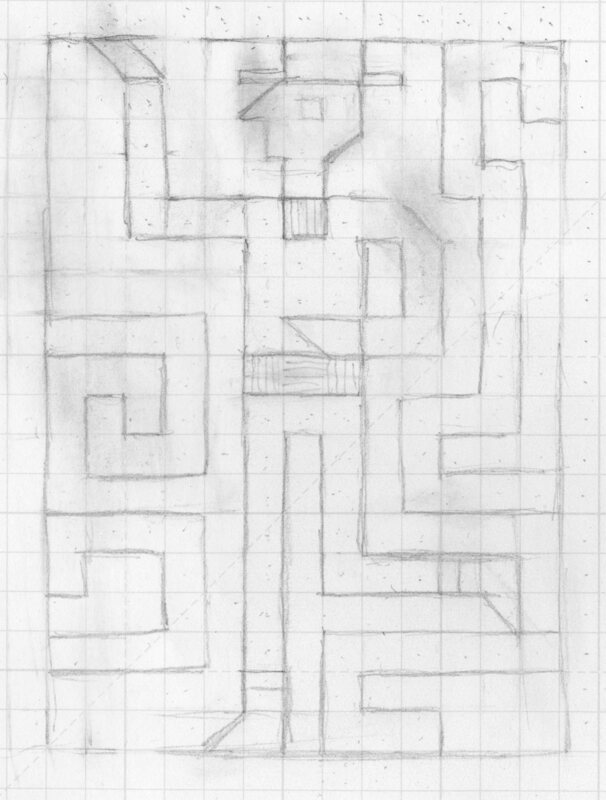 Once I knew how many squares were available, I drew up a plan. 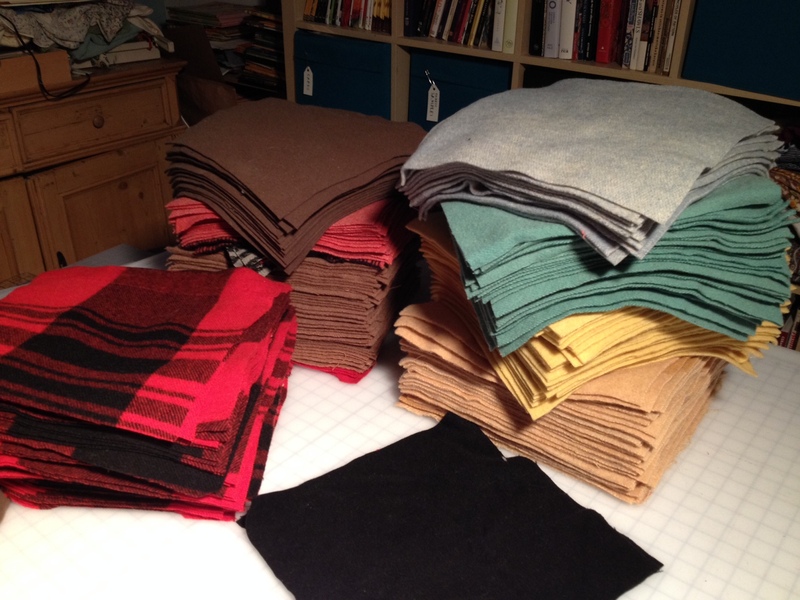 Each ¼” square would be a 12″ wool piece. I didn’t have a room large enough to lay it out, so I borrowed one from Coyote Central. 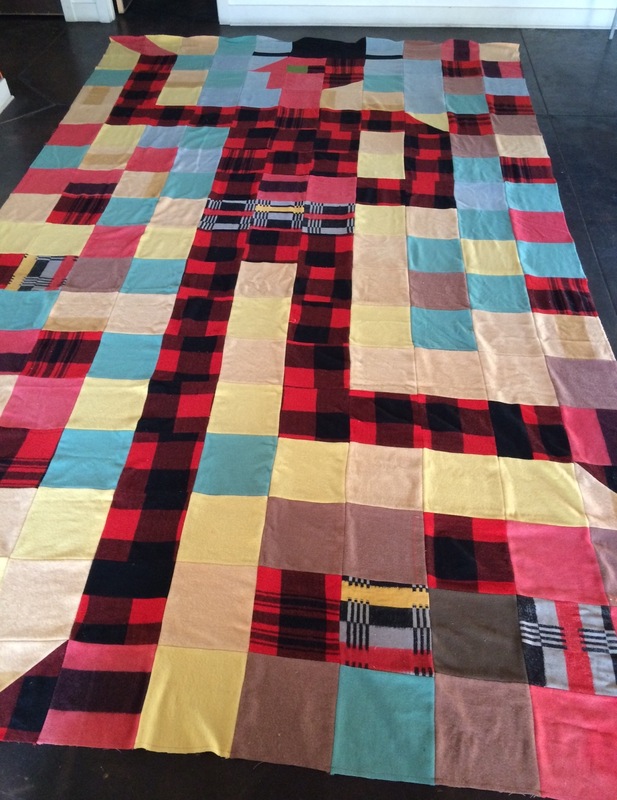 Once I saw the quilt I took away the two outer rows bringing it down in size to 11′ x 18′. I left the figure intact but rearranged the background several times. After I saw how big it really was I felt overwhelmed and wondered what on earth I was doing. But if I didn’t keep going than I had needlessly destroyed a lot of nice blankets. So I picked up each row and put it in its own bag. I came home and sewed. 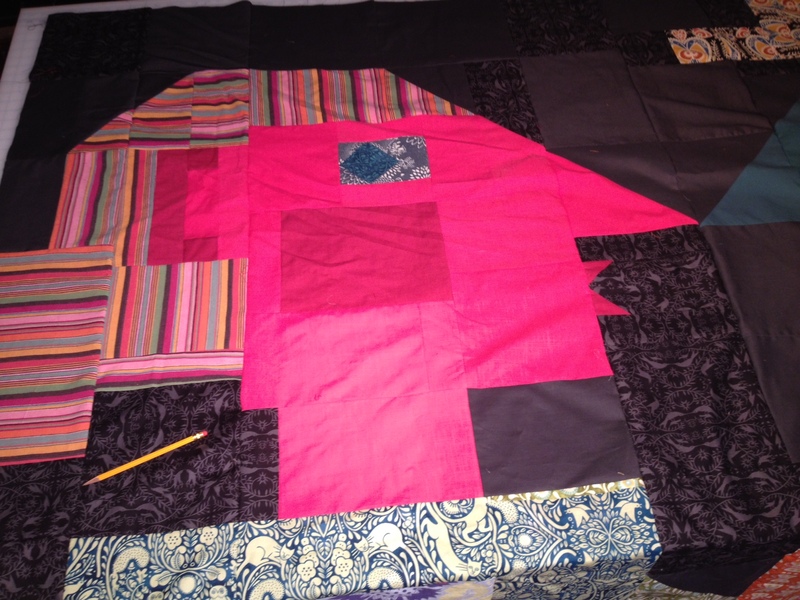 The sewing became more cumbersome as the quilt grew. But it was possible! It was even fun; the ridiculousness of the project made it entertaining. The finished blanket was once again too big to spread out in my house, so I took it back to Coyote for a look. I stood on a ladder to photograph it. And then took a rest (photographed by Marybeth Satterlee). In May I will be having a show at the Bitters Barn in La Conner. I hope Mr. Big will fit on a barn wall there. 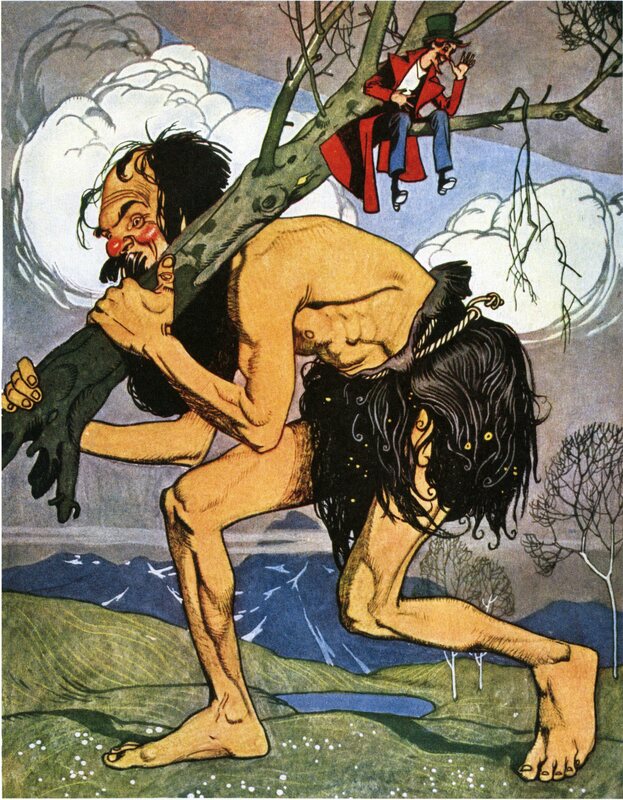 After that I will need to find either a cold giant in need of a blanket, or a giant wall. Hmmm. This entry was posted in Uncategorized and tagged bitters, coyote central, giant quilts, Julie Paschkis, Quilts, wool blankets. Bookmark the permalink. Yes – those old blankets are precious. And I am so sorry to hear that your mother passed away – my condolences. Thanks for sharing this. I wish I could see it in person. Yes – crazy for sure! Say, could you do me a favor? Could you take a look at my latest? I’d love an honest opinion. I love the colors. They are rich and earthy. The purple and gold keep it lively. I especially like the little border of squares floating in the outer section. Nice! I am so glad you included yourself in the photograph. That quilt is OMG big! It could be a house cozy. There was a technical bookstore on 15th Ave. that was covered in crocheted afghans for a while – it looked great. Awww, you look like a little mouse curled on the blanket. Thanks for your comment and hello to you at Foulkeways! Your mind works in the most marvelous way Julie! I love it! This is amazing! I love it. 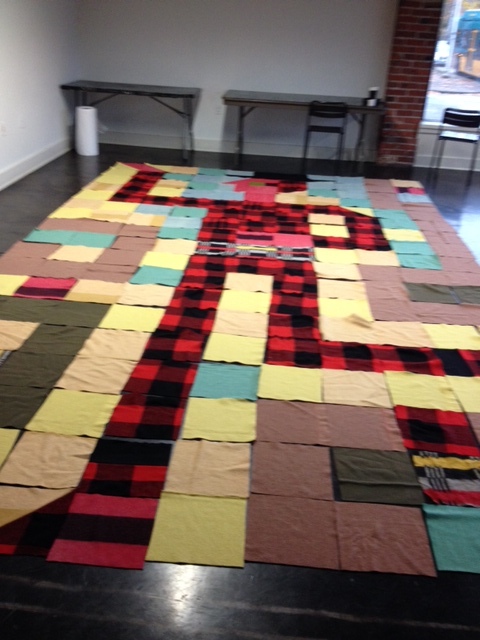 Also, it’s great to see the process as well as the finished quilt. The whole thing is so much fun. Hi Julie, I was in the class down in Ballard with you a while back. Do you know where they still carry the folklorica fabric? I don’t know – fabric is like fruit. It has a short shelf life. You might be able to find some on etsy or eBay. It sounds like you are still quilting- yeah! Ms. Paschkis, I do not think the quilt of Mr. Big is too much and this is why. Once I crocheted a blanket for a doll I made called Pinkle Winkle and gave it to a nurse at our local hospital for her little girl who liked to curl up in a corner with a blanket and a doll to read to the doll. Now that large Mr. Big might have a place in someone’s home. rolling that up to store would be terrible, but seeing that in a home, well, that is reminds me of how I like awesome sewing time and warm quilts with a story on them, then crawling up into a bed to read on a miserably cold day in Mississippi. You do have a talent, amazing gifts you are, a treasure. In Birch Harbor, Maine there is a lovely restaurant called The Pickled Wrinkle. It is named after pickled whelks – a Maine delicacy. The doll Pinkle Winkle could go to that restaurant! Her quilt would be good for the long Maine winters.